As the leader in bulk material automation, Kahler has solutions to handle weighing, mixing and transfer regardless of type of equipment used. 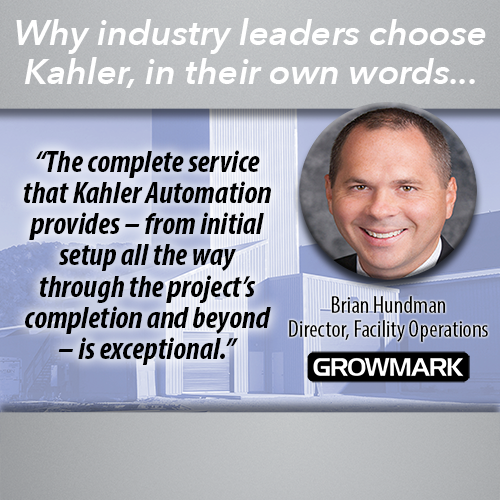 From simple equipment control from a loader, to complete system control of a mega-facility, Kahler has the experience to drive results and create a competitive advantage for your material handling facility. Learn more about Rail/Truck Receiving Systems, Reclaim Systems, Truck Loadout, Software, and Truck Traffic Control below. Starting with receiving of bulk dry product, the system controls the equipment used to bring product into the storage facility. When a truck or railcar pulls over the receiving pit, the operator is able to begin a staged startup from a panel by pressing the “start” command. Each piece of equipment engages in sequence. As the leader in bulk material automation, Kahler has solutions to handle weighing, mixing and transfer regardless of type of equipment used. From the largest towers utilizing multiple bins and a powerful mixer, to floor-mounted equipment that uses process blending, Kahler has the contols. Once the product is in the storage facility, the Kahler system controls the equipment used to transfer it to the weighing device or elevate it to the correct bins, all while monitoring sensors to ensure everything is operating correctly. An optional tablet inside the loader with Kahler’s Plant Supervisor software installed provides immediate efficiency gains while reducing wear on operators. Ultimate performance is achieved in an office environment using the Kahler software suite to run equipment in preparation for loadout.